Born in 1958 in Bayonne (France), Bertrand Dubedout was schooled in his birthplace where he also began studying music. He went on to advanced musical training at the University of Pau, with Guy Maneveau and Marie-Françoise Lacaze, then at the Paris Conservatoire in the classes of Pierre Schaeffer and Guy Reibel (Electro-acoustic Composition and Musical Research), winning the Composition Prize in 1981. He also studied at the Centre d’Études Polyphoniques de Paris and the University of Paris. He is currently a tenured professor of electro-acoustic composition at the Toulouse Regional Conservatory. Founder of the Ensemble Pythagore in 1988, he is also co-artistic director of the éOle collective and the Novelum festival. Since 1981 he has received commissions from the state and institutions such as the GRM (Musical Research Group), Radio-France, CIRM, GMEM, GRAME, et al. 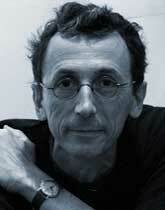 In France, he has been guest composer of festivals such as Présences (Radio-France, Paris), Aujourd’hui Musiques (Perpignan), Agora (IRCAM, Paris), Solistes aux Serres d’Auteuil (Paris) and Déodat de Séverac (Toulouse), the 38èmes Rugissants (Grenoble), MANCA (Nice), Les Musiques (Marseilles) and Musiques en Scènes (Lyons), and abroad, Realm (Helsinki), Roma Europa (Rome), Musica Viva (Lisbon), CCMC (Tokyo), L’Espace du Son (Brussels) and International Modern Music Festival (Kobe, Japan). His works have been performed by ensembles such as the Diastéma Quartet, the Pulsaxion duo, Ensemble Cercles (Switzerland), Ensemble Icarus (Italy), Sond’Ar-te Electric Ensemble (Portugal), Ensemble Orchestral Contemporain, 2e2m and Ensemble Orchestral Perpignan Languedoc-Roussillon, and by soloists including Claude Delangle, Jean Geoffroy, Donatienne Michel-Dansac, Sonia Turchetta, Marie Kobayashi, and Finghin Collins. SACEM awarded him the Claude Arrieu Prize in 1997. Two years later, he was named composer-in-residence at the Villa Kujoyama in Kyoto, Japan (Villa Kujoyama Programme, AFAA [French Association for Artistic Action] / Ministry of Foreign Affairs). At the beginning of cach work, a referential color comes to the fore, flasching like a beam of light around which everything will be played out, like a primordial surge, a scene of movement and fluctuation which can swell without limit. Thus generated, the process joins up with a mysterious itinerary, and the result obtained can sound resolutely personal. Working with a highly refined feel for polyphony, Dubedout explores vibratory space and sensitizes the ear to the most subtle of intervals, above all when he chooses the homogeneous sounds of four saxophones : a true acoustic experience. The First Book of Fractions du Silence (1994), perhaps the most radical example, beckons us to listen in on the inner reaches of sound, into the live burgeoning of resonance. With a subterranean energy pushing his works onward and propelling sound towards ever more luminous regions without renouncing the point of anchorage, Dubedout’s music acquires incantatory force. Through reiterated impulses (one thinks of Varèse), obsessive reworkings and an intense process which often solidifies material until it explodes, Dubedout likes to keep the listener’s ear under tension, until an emotional discharge grabs hold with a power -if not violence- transmitted by sudden explosions of sound. - CD release: Zazpiak B for marimba solo, by Jean Geoffroy, and Zazpiak Z for instrumental ensemble, by the ensemble Court-circuit, under the direction of Jean Deroyer, for the label éOle Records - éOr_011. - CD release: Zazpiak N for piano solo and instrumental ensemble, by Francis Perron (piano) and the Nouvel Ensemble Moderne (of Montreal), under the direction of Lorraine Vaillancourt, for the label éOle Records - éOr_016.